Don’t have room for a traditional garden? Want to conserve water? Away from home often? Try a sub-irrigated planter! Sub irrigated planters have a water reservoir beneath the soil level that is fed from the top, using a pipe or a hose. When correctly designed, the water is continually wicked up to plant roots through the soil. This means the plants always have water when they need it. Happy plants! Years ago, while still an apartment dweller, I bought an expensive pre-made sub-irrigated planter for my small deck. It worked wonderfully and I still use it to this day. This year, I wanted to inexpensively expand my container garden, and so I set about looking for a way to convert some of my old traditional planters to sub-irrigated systems. While I was at it, I grabbed a can of spray paint (for extra blogger points!) and gave the tired, old planter a refresh on the outside as well, painting the entire outside, but only to my planned soil level on the inside. Once the paint was completely dry, I assembled my sub-irrigation setup, filled the planter with organic potting soil, popped in a Red Beefsteak tomato start, and topped it off with a support cage. 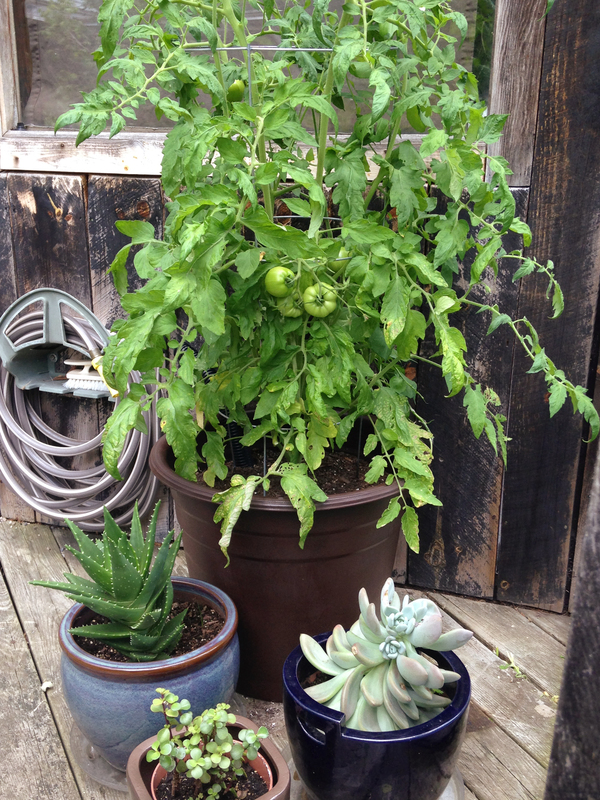 Some paint, a couple of deli containers and some flexible hose leftover from our rain barrel project turned this old eyesore into a sub-irrigated planter worthy of the deck! Update: The tomato plant loved this planter! I topped off the water every 3-4 days or so. If you are making one for yourself, don’t forget to drill a hole in the side of the planter so that you can see the overflow when the water level is at full. P.S. Missing the cabin photos? Don’t worry – I’m constantly capturing cabins as I come across them in my travels. In the meantime, follow me on Instagram for more cabin shots @newdreamcabin!